t*rexes and tiaras: got a date with the night.. This dress was something I spotted when I was shopping in Warwick with Sarah on Saturday. Sadly the shop we were in only had one left, which wasn't in my size and also had a mark on the fabric, so I took a sneaky look at the label and was determined to find myself another. Which I did, for a few pounds less and with free shipping, from this site.I ordered it via my phone on Sunday and picked it up from the collection office yesterday evening, which I think is rather good! 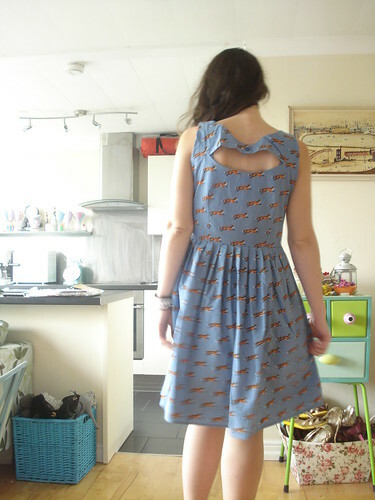 Another dress with a cut-out back section, I'm getting obsessed. Also another in my collection of brightly coloured handbags! These Moony Mood bags are such great quality for their price, that I'm slowly building up a rather colourful collection. 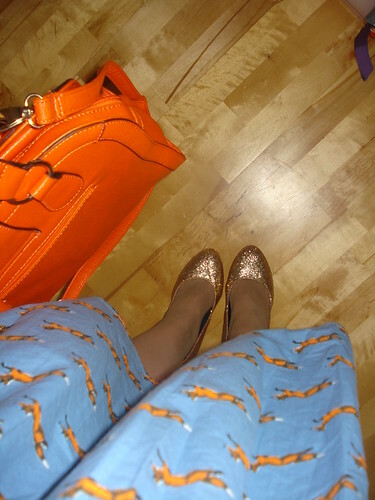 I love the fact that I've geekily matched today's orange one to the orange foxes in the dress. I also had a bit of a 'mare trying to find some similarly bright orange shoes, but settled for these gold glitter ones instead. If in doubt, always add glitter! I love that song! Genuinely started singing it in my office! Got some strange looks to. 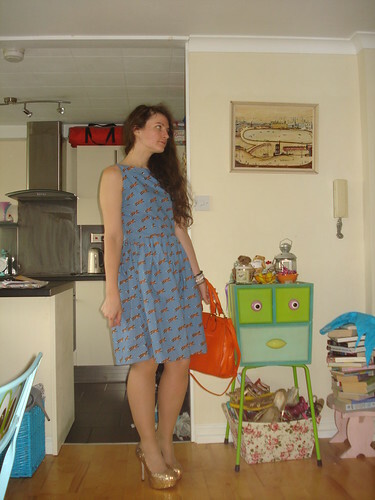 Great dress and love the matchy-ness of the bright orange bag. Hope you get all your camping plans sorted. That print!!! Amazing dress and love it with the glitter shoes.